Can you imagine being able to remotely measure seismic activity on another planet? NASA’s InSight mission launched this weekend to do just that, hopefully providing “insight” into the formation of our solar system by looking deep into the interior of Mars. 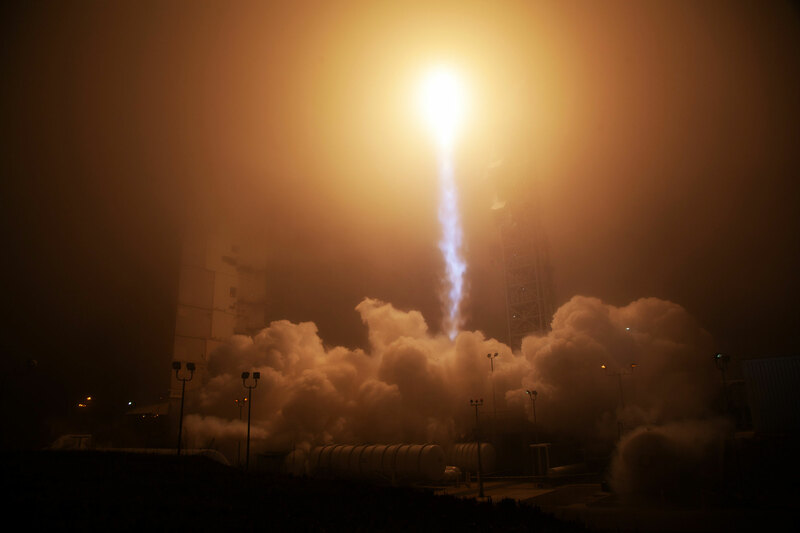 InSight roared away from the launchpad at 4:05am PDT on Saturday, May 5th from Vandenberg Air Force Base in California, flying south on its journey to space. It was NASA’s first interplanetary launch from the West Coast, and 21st mission to the Red Planet. Hidden from view in a thick layer of fog, the Atlas V 401 rocket launched right on time, eventually breaking through the mist to provide a light show for early risers in Southern California. 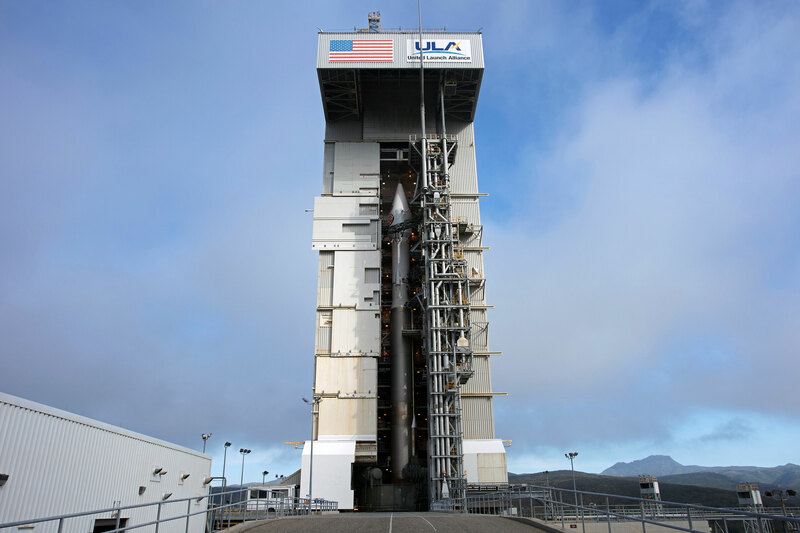 Since the size and weight of the spacecraft was relatively small (only 1,530 pounds or 694 kilograms), NASA and United Launch Alliance (ULA) were able to launch to the south from California into a polar orbit. Launching from Cape Canaveral in Florida is necessary when a launch requires the use of Earth’s rotation to slingshot a craft into eastward orbit, but that extra boost that wasn’t necessary for the InSight launch. In fact, the power of the Atlas V rocket was about double what's required to send it to Mars. 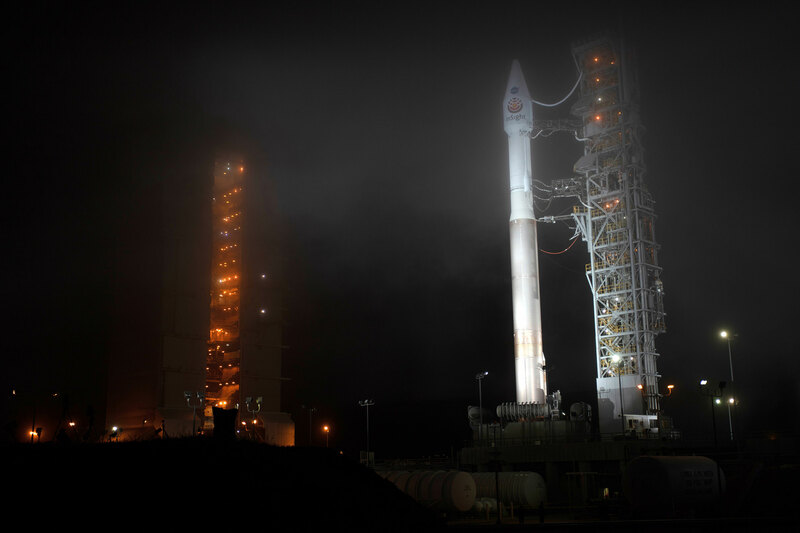 InSight awaiting launch at Space Launch Complex 3 on a foggy night at Vandenberg Air Force Base in California. By measuring “marsquakes,” InSight (Interior Exploration using Seismic Investigations, Geodesy and Heat Transport) will collect data needed to map the deep interior of Mars. This 3D view inside the planet will help us understand the structure and composition of the planet’s rocky crust, thick mantle, and dense metallic core (which at one point was liquid, but may now have partially or completely solidified). By comparing these findings to what is already known about Earth, scientists can hopefully answer key questions about the formation of all four rocky planets in our inner solar system: Mercury, Venus, Earth, and Mars. Compared to Mars, Earth’s interior has been very tectonically active in the 4.5 million years since they both formed; that activity has erased almost all geologic evidence of Earth's early history. Mars is like a time capsule of planetary history, having remained mostly static for the past 3 billion years with the secrets of our solar system’s early history locked deep inside. With deployed solar arrays, InSight is 19 feet wide (6 meters), just over 3 feet tall (~1 meter), and weighs only 790 pounds (358 kilograms). This is a full-scale model of lander. 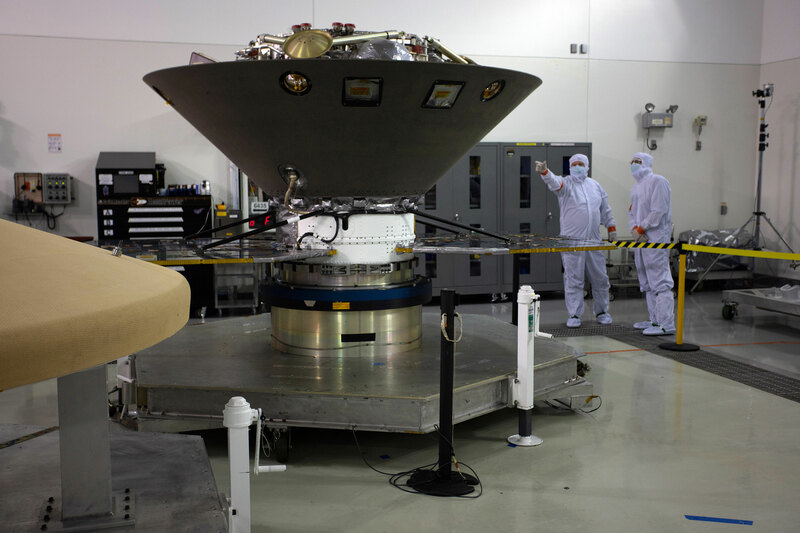 InSight has three primary scientific experiments on board. First, an ultra-sensitive seismometer will be placed in the Martian soil by a robotic arm. This will be used to measure marsquakes as they ripple and shake the planet. “As seismic waves travel through Mars, they pick up information along the way as they travel through different rocks,“ explained InSight’s Principal Investigator Dr. Bruce Banerdt. The instrument is so sensitive that it can detect displacements with a distance smaller than the diameter of a hydrogen atom. This sensitive tool will also measure the rate of meteorite impacts by detecting when they hit the planet. A second instrument, the HP3 probe, will burrow, like a mechanical mole, to a depth of 16 feet (5 meters) while installing a string of sensors. These sensors will measure heat flow rising from the deep interior of Mars, capturing vital signs from the heat engine that drives the planet’s geology. “If you see mountains, see giant valleys that are formed by rifts, or volcanos, those are all being driven by the heat flow of the planet, as well as fault activity,” reported Dr. Banerdt. Understanding how heat flows from the core of Mars will help scientists determine how the interior has evolved over time. Like the seismometer, the HP3 sensors on their way to Mars are also ultra-sensitive, able to measure temperature differences as small as .002 degrees Fahrenheit (about .001 degrees Celsius). The third experiment is the craziest to comprehend. In order to measure variations in Mars' rotational axis, InSight will bounce back radio waves sent from Earth. With the lander as a static, known-location marker on the Martian surface, this radio tracking system will utilize the Doppler effect to determine how far Mars sways on its axis -- with an accuracy of about 4 inches (10 centimeters). The planet's axis wobbles as it rotates because of "sloshing" that happens in the metallic iron-rich core -- which may or may not still be partially liquid. Five countries worked together to supply the mission’s scientific instruments: the USA, Germany, United Kingdom, France, and Switzerland. In addition to those instruments, a computer chip is along for the ride with the names of 2.4 million people who responded to a call from NASA to be involved in the mission. InSight in the Astrotech cleanroom at Vandenberg Air Force Base in final preparations for launch. Only part of the lander’s legs are visible above the aeroshell capsule that will protect it on the 6-month journey to Mars. Part of the spacecraft’s yellow heat shield is seen to the left waiting for installation. 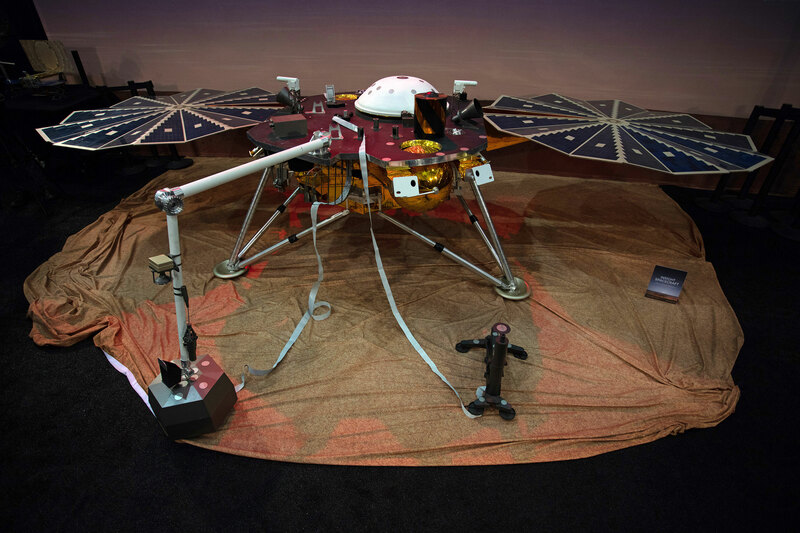 The design of the InSight spacecraft and lander is built on a legacy of NASA’s past success stories, primarily the Phoenix mission that landed in the northern polar region of Mars in 2008. The basic structure and layout of the lander are copied from Phoenix, as are the onboard thrusters that will bring InSight to a powered landing on Mars. The far-heavier MSL Curiosity Rover utilized a more complicated “sky crane” system used to land in 2012. Other missions have bounced and rolled to a stop with airbags. InSight’s Atlas V rocket sits inside of the Mobile Service Tower at Space Launch Complex 3 the day before launch. After six months of interplanetary transit, InSight will direct its protective heat shield towards Mars, open its parachute in the thin upper-atmosphere, and fire its thrusters to touch down on the Elysium Planitia near the planet’s equator on November 26th, 2018.